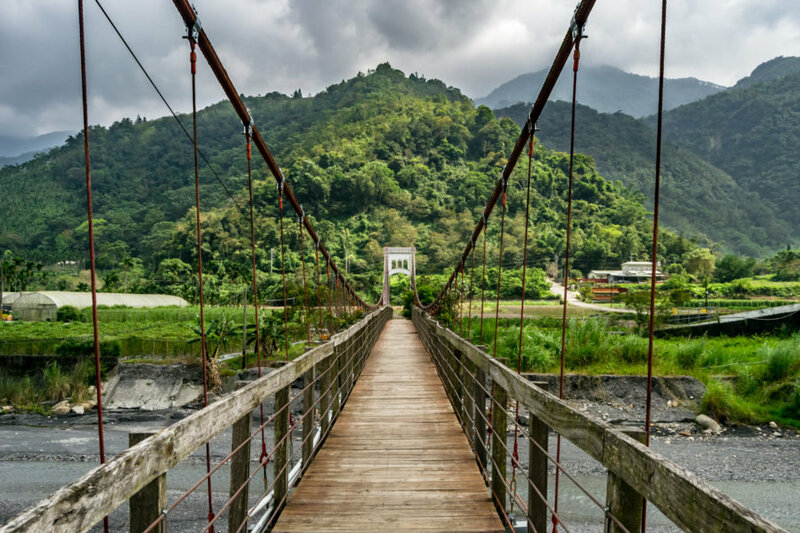 My second day on the road in Nantou County in October 2015 was completely unplanned. I left Pǔlǐ 埔里 and headed deeper into the mountains simply to see what was there, not having done any advance research. From a glance at the map I had a rough idea where I’d be going—deeper into traditional indigenous lands to the east of Puli Basin 埔里盆地. Ultimately I ended up visiting several settlements and two reservoirs in a few hours of riding around what is now known as the township of Rén'ài 仁愛. 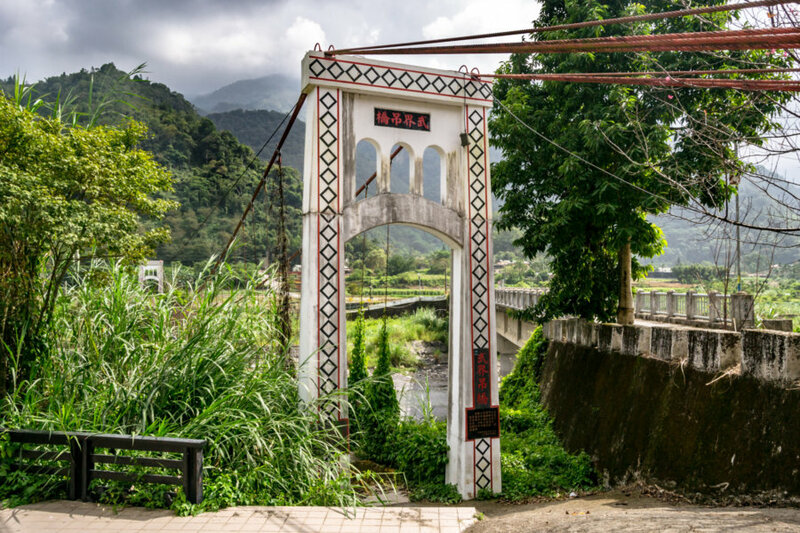 Ren’ai Township is entirely beyond the former Tǔniú Boundary Line 土牛界線, a porous frontier dividing Han Chinese lands from indigenous territory in Qing dynasty era Taiwan1. At its greatest extent in 1875 this boundary encompassed Puli and neighbouring Yúchí 魚池, home to Sun Moon Lake (and the subject of a future post in this series). Imperial Japan, after conquering the lowlands in 1895, embarked upon a long and often violent mission to assimilate the high mountain tribes over the course of the next half century. The colonial authorities were intent on exploiting the natural resources of the interior—primarily camphor and lumber, but also certain minerals—and legitimizing Japan as a “civilizing” power on par with the nations of Europe. 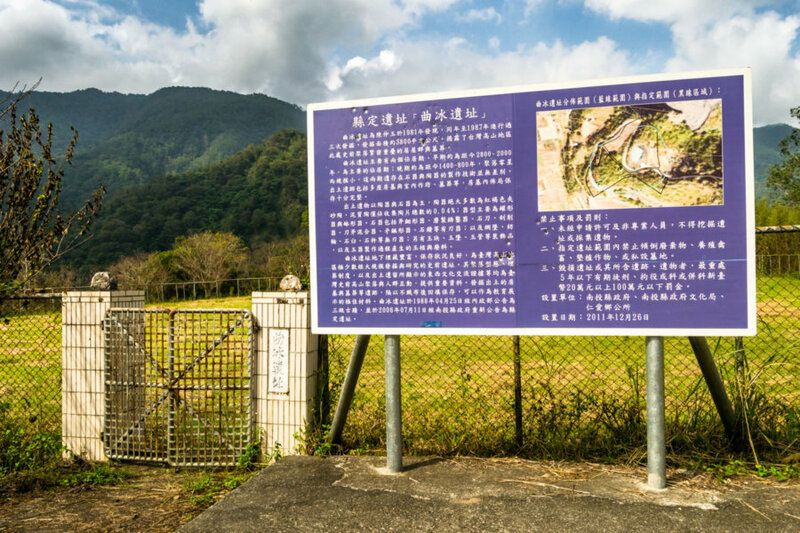 Despite this, what is now Ren’ai Township was administered as the fāndì 蕃地 (literally “savage land”) of Nōkō County 能高郡 until control was relinquished in 1945. Only in 1950 was Ren’ai given its present name, one of several common terms derived from the ideology of the ruling KMT party2. 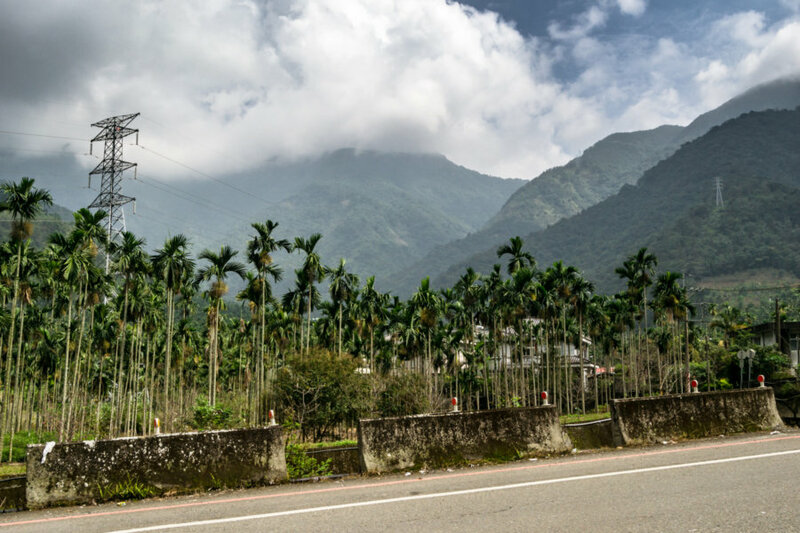 After departing from Puli I headed southeast along Wǔjiè Road 武界路 (also known as 投71鄉道), driving through mushrooms farms and betel nut plantations on the way to the mountains. Puli Basin bottoms out at approximately 500 meters above sea level so it’s quite a climb to where the old road slips over a pass at 1,300 meters elevation. 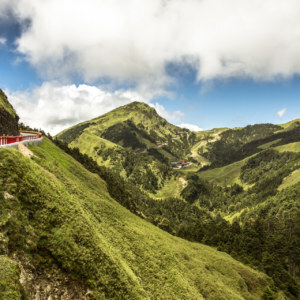 Since 2006 there is a shortcut: the kilometer-long Zhuōshè Tunnel 卓社隧道, punched through the mountain at roughly 1,000 meters. 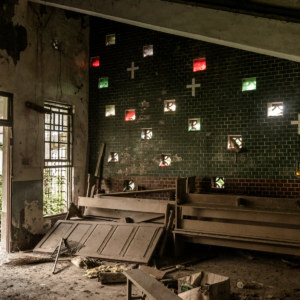 The interior is quite damp, a consequence of considerable groundwater seepage, which makes for a slick ride through the dimly-lit passage to Ren’ai Township. Average roadside vista on the way out of Puli Basin: betel nut trees everywhere. Descending Into Wujie Village and the Zhoushui River Valley. This is the view after passing through the Zhoushe Tunnel. Now entering Bunun tribal lands. 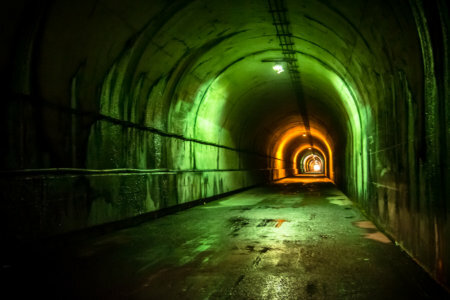 The view from the other side of the tunnel is spectacular (have a look at the first photo in this post to see what I mean). 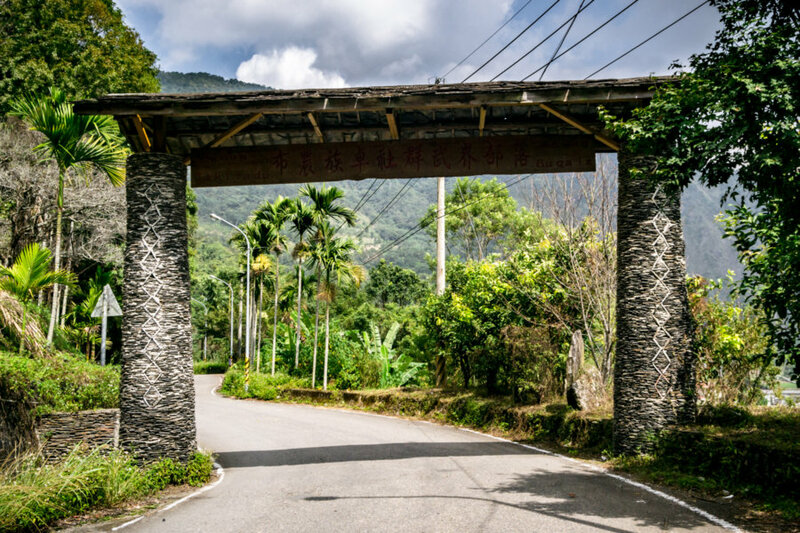 After a sharp descent along twisting mountain roads I passed through a stone slab gateway3 and arrived at the home of the Wǔjiè tribe 武界部落 of the Bunun people 布農族. In official terms this is Fǎzhì Village 法治村 but Boqaiv is the traditional name for this place in the Takituduh dialect of the Bunun language. From what I’ve read this tribe was brought out of the mountains to the south and forcibly settled here in 19194. Additional information about Boqaiv can be found in English here and in Chinese here, here, here, here, and here. 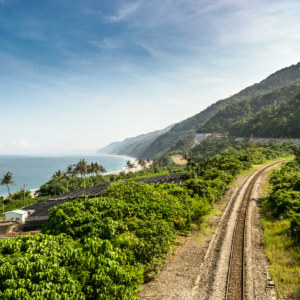 Boqaiv sprawls across the Zhuóshuǐ River 濁水溪, the longest in Taiwan, which meanders south through the mountains before turning due west toward the South China Sea. 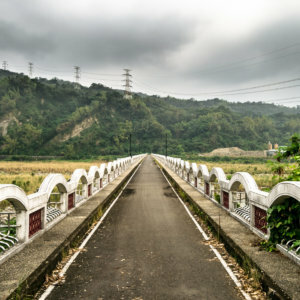 The Zhoushui River divides Changhua from Yunlin and has traditionally been an informal boundary between north and south Taiwan. 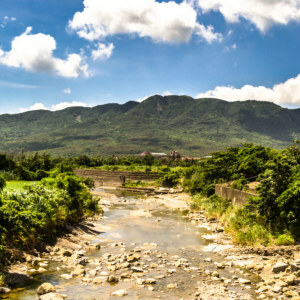 Here in the high mountains it is a sluggish, silty stream, from which the name—which means “muddy” or “turbid” water—is derived. 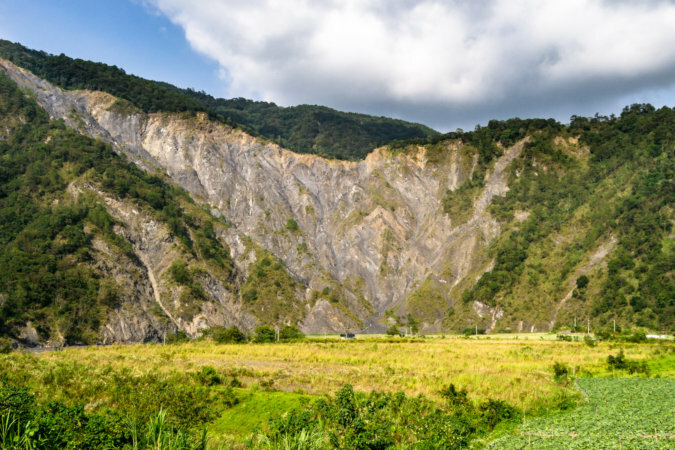 This high sediment load is a result of the many landslides that occur in the highlands, particularly after earthquakes and typhoons. 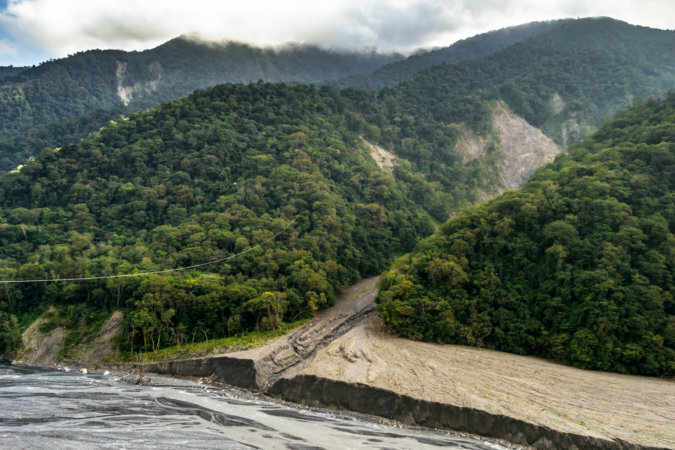 Extreme rainfall events can wash an incredible amount of material into the river, something you’ll see direct evidence of in the photos to come. The view across the suspension bridge. 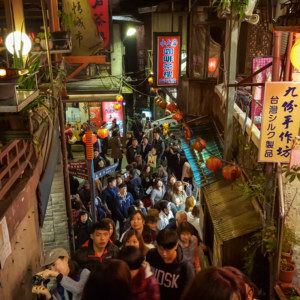 Nowadays it is only for tourists and foot traffic. 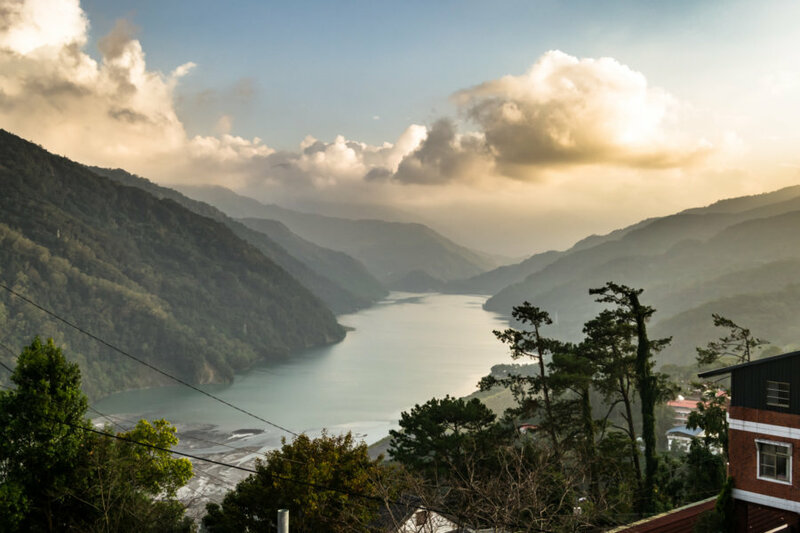 Wujie is also home to a historic dam and reservoir of the same name, both part of the much larger Sun Moon Lake Hydroelectric Project 日月潭水力電氣工事. Construction began in 1919 but came to a halt a few years later due to the global post-war recession. 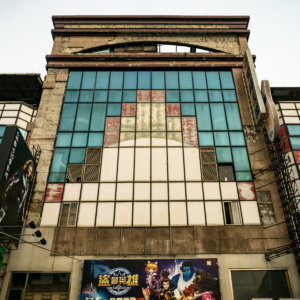 Work resumed in 1927 and what is now known as the Dàguān Power Plant 大觀發電廠 began generating power in late 1934. 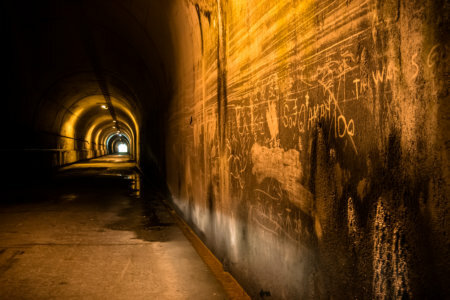 Wujie Dam 武界壩, located approximately 20 kilometers from Daguan, diverts the flow of Zhoushui River through a 15 kilometer-long tunnel (武界引水隧道) to Sun Moon Lake 日月潭, raising the water level by about 20 meters and increasing capacity sixfold. This complex system, one of the world’s most elaborate hydroelectric projects of its time, was designed to ensure a constant supply of water to downstream generating station. In the many decades since it was built this system has been continually improved and expanded. The view from just inside Wujie Reservoir. The old colonial dam is obscured on the right; a more modern dam can be seen on the left. 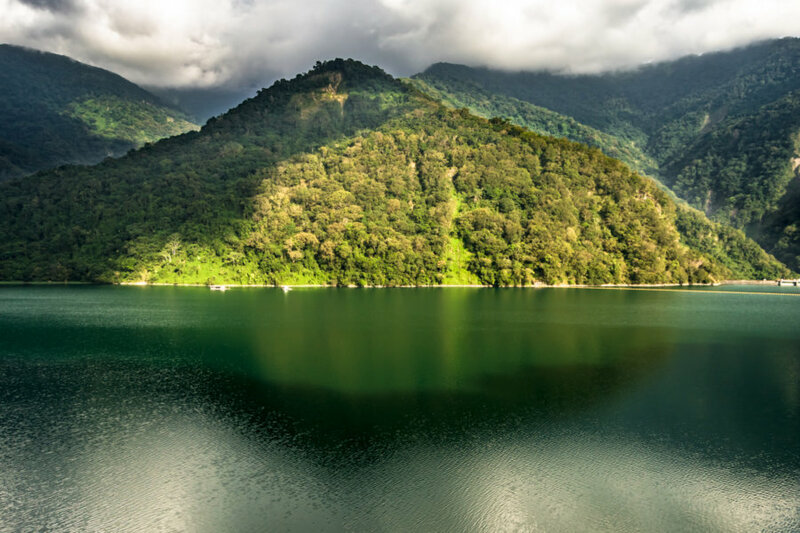 What makes the waters of the reservoir such a vibrant shade of turquoise? I suppose I wasn’t that surprised when I first observed this phenomenon at Wujie—after all, aren’t mountain lakes often this bright? 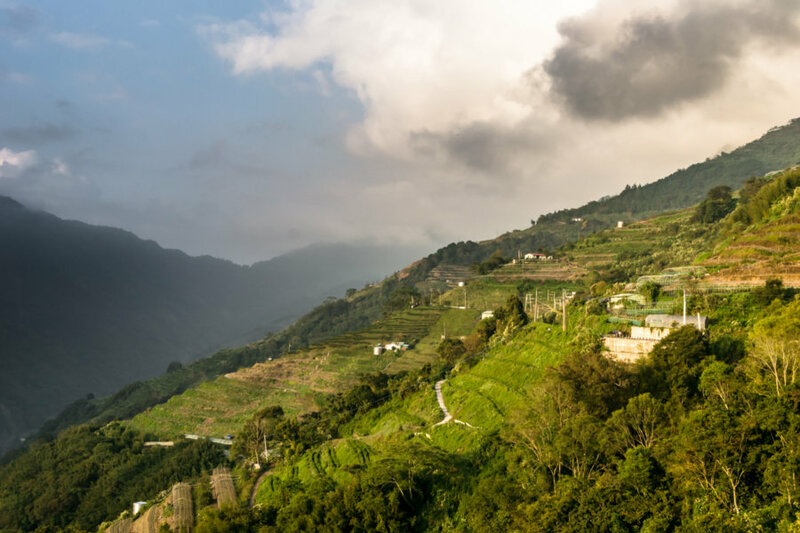 In temperate and alpine areas this effect is commonly caused by rock flour deposited by glaciers but Taiwan, even with its many high mountains, does not appear to have experienced much glaciation in recent eras. That being said, the mechanism is probably the same: sediment suspended in the water column absorbs certain frequencies of light to produce a milky or turquoise appearance. 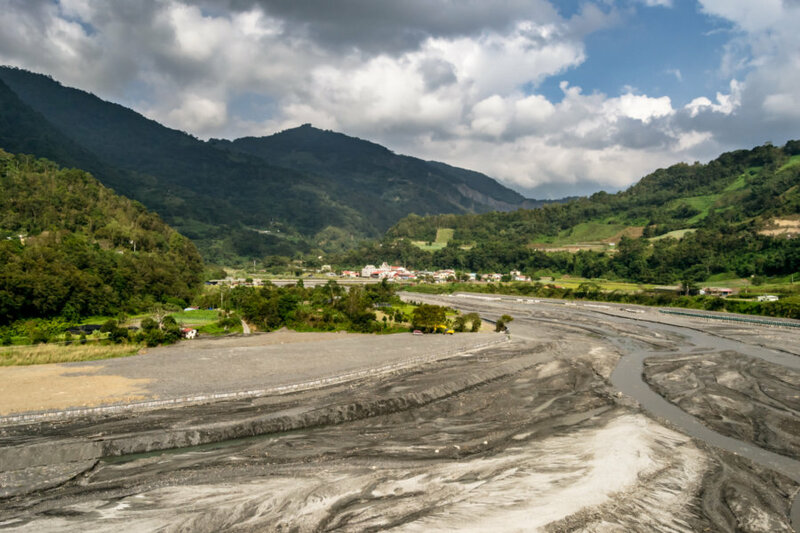 Not just any sediment will do—it needs to be of the right particle size and chemistry—but apparently the conditions are met here in the mountains of Nantou, which are primarily made of uplifted sedimentary rock. Looking north from the eastern side of Wujie Reservoir. This image is real; the water really is that shade of turquoise! Heading north along the reservoir I soon entered the northernmost settlement of Bunun people, a place known in the Takituduh dialect as Sima-un and in Chinese as Wànfēng Village 萬豐村, home of the Qūbīng tribe 曲冰部落5. This tribe was famously involved in the Zǐmèiyuán Incident 姊妹原事件 in 1903, an event dramatized in the Taiwanese cinematic epic Warriors of the Rainbow: Seediq Bale. In short, the Japanese persuaded this tribe to ambush a large party of Seediq people 賽德克族 from the Tgdaya group who were lured downriver under false pretences. 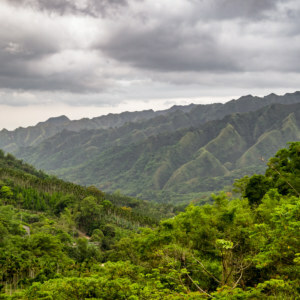 After a feast and celebratory drinking the Bunun slaughtered approximately a hundred Seediq, greatly inhibiting their ability to resist Japanese advances into the highlands. 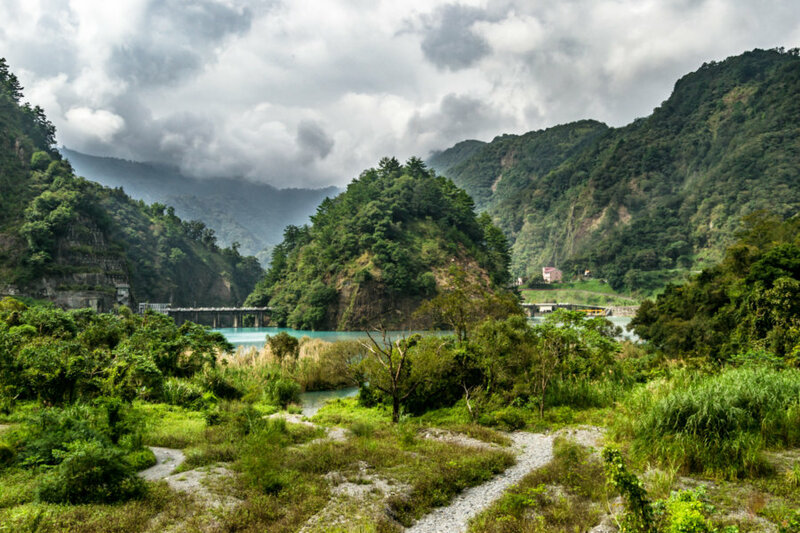 This massacre occurred not far from where Wujie Dam was built several decades later. 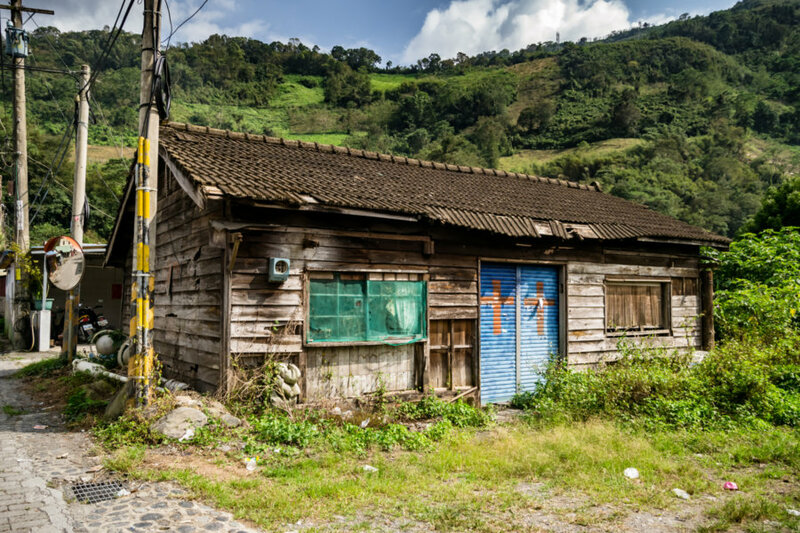 An abandoned house in Sima-un. 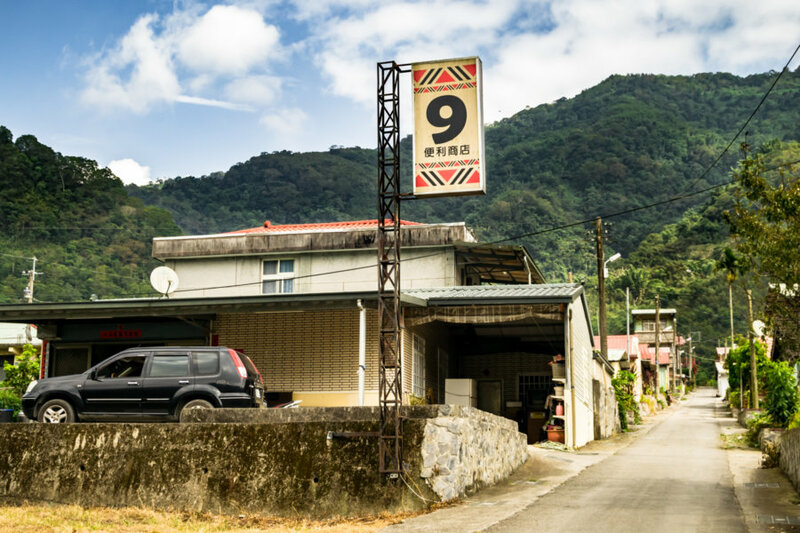 It looks Japanese but this settlement only dates back to 1949. 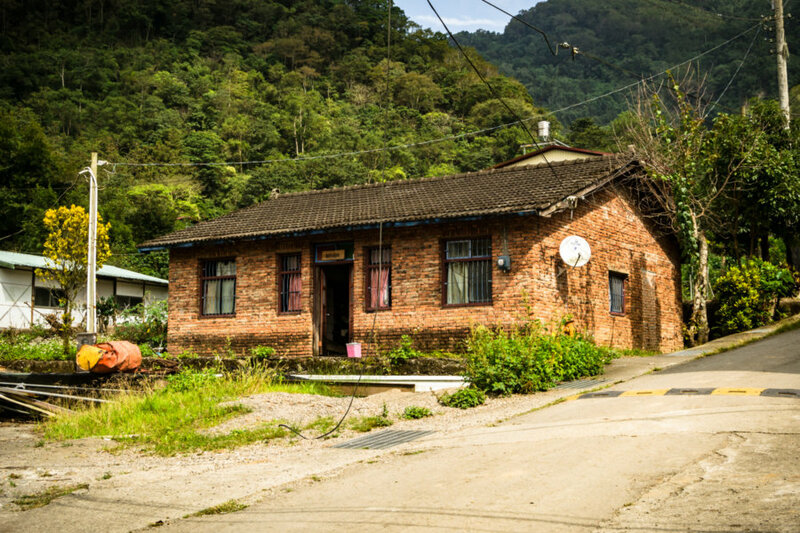 This brick house has a nameplate over the door, much like you’ll find on other homes in rural Taiwan. The difference is the lettering—it’s a local Bunun name written with the Latin alphabet, not Chinese characters. 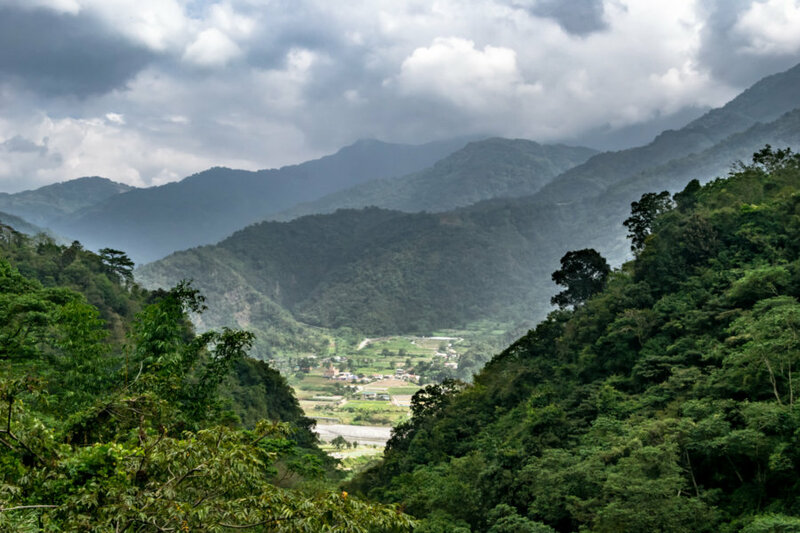 In 1922 this tribe was forced out of the mountains and settled at a place named Ququaz (Chinese: Gēgēyuán 哥哥原) on the east side of the Zhoushui River. 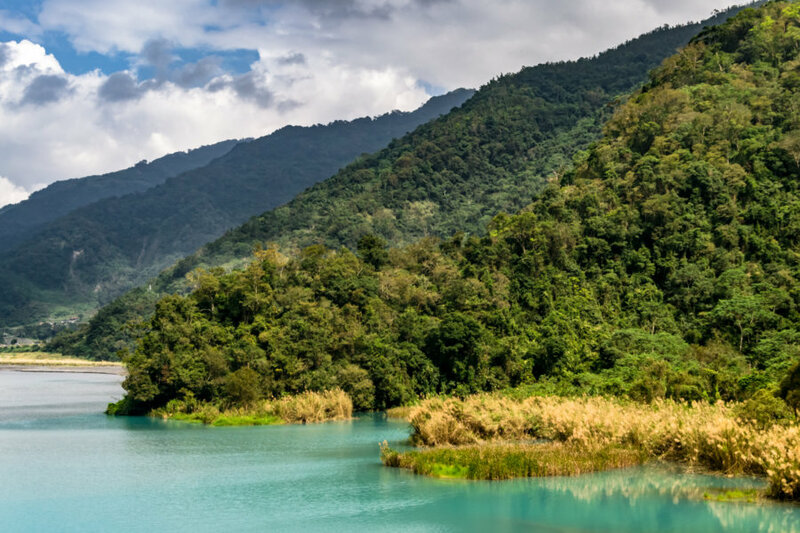 The completion of Wujie Dam and the accumulation of silt over the years caused the tribe to relocate twice more, making Sima-un their third home in the area. Just north of Wanfeng Village one will pass the Qubing Ruins 曲冰遺址, an archaeological site excavated by Chén Zhòngyù 陳仲玉 from 1981–1987. 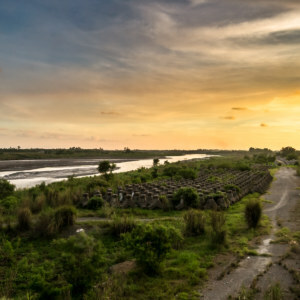 His team found an entire village with dozens of homes, nearly two hundred stone sarcophagi, and tens of thousands of artifacts, many showing evidence of extensive trade across the region. 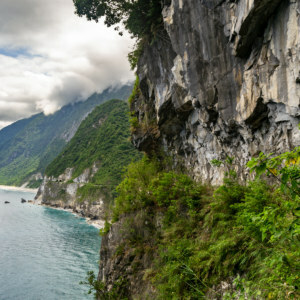 It was a significant discovery—the first of its kind in the mountainous interior of Taiwan—and, with signs of human habitation going back as far as 3,500 years before present, it also ended the debate about whether Taiwanese indigenous people had settled the mountains prior to the arrival of Han Chinese settlers in the 1600s6. I had no idea about any of this when I swung by so I only snapped one quick photograph without examining the site too closely. 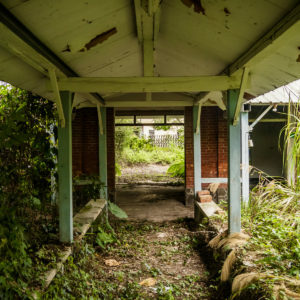 There probably wouldn’t have been much to see anyway; the site appears to be completely overgrown despite its status as a third-class national monument. Massive deposits of silt choke this bend in the river north of the reservoir. The small settlement in the distance is Pulan, home of the Songlin tribe. I continued north, exiting Bunun territory, and soon arrived in Pulan, home of the Sōnglín tribe 松林部落. A century ago this was Seediq territory but a group of closely-related Truku people 太魯閣族 from the highest reaches of the Zhoushui River were relocated here in the immediate aftermath of the Musha Incident 霧社事件 in 1930. This village moved several times, much like the others already described in this post, before settling in its current location in 19507. Knowing none of this I drove around the back of the village and stopped for lunch at a small eatery with a picnic table out front. Turns out the boss was Han Taiwanese who had married into the tribe so it was standard Taiwanese fare—steamed dumplings, if I recall correctly. I enjoyed making smalltalk with some curious locals while dining before hitting the road again. 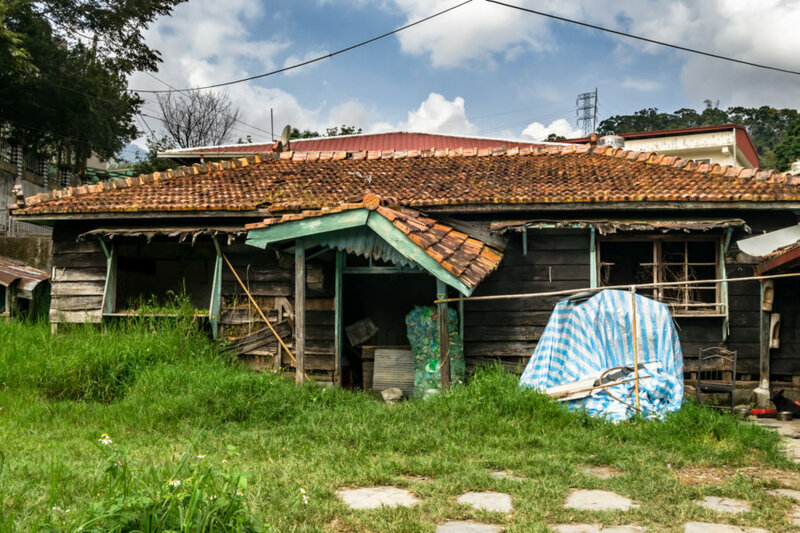 Another abandoned wooden home, this time in Pulan, a Truku settlement. This is right next door to a Presbyterian church, perhaps a priest lived here long ago? A massive landslide scar along a bend in the upper Zhoushui River. The shadows were growing long as I sped by Wàndà Power Plant 萬大發電廠 on the way to Wùshè Dam 霧社壩 and the stunning reservoir of the same name. The power plant entered into service in 1943 but the dam and reservoir were not completed until 1957. This reservoir also has a major siltation problem but this only becomes obvious at the far end. From the viewpoint at the deepest end of the reservoir it seems absolutely idyllic. Clouds casting shadows over the far side of the reservoir. I spent the last hour or so riding around places I’ve already seen on previous trips, particularly this crossing of the Central Mountain Range in 2014, so I didn’t take many photos. Once you get anywhere near Qīngjìng Farm 清境農場 the many coach buses that ply these mountain roads become so hazardous that stopping to take a quick picture becomes much less appealing. I ended up making the journey back to Puli at dusk, impressed with what I had seen on this random ride through the mountains of Ren’ai. 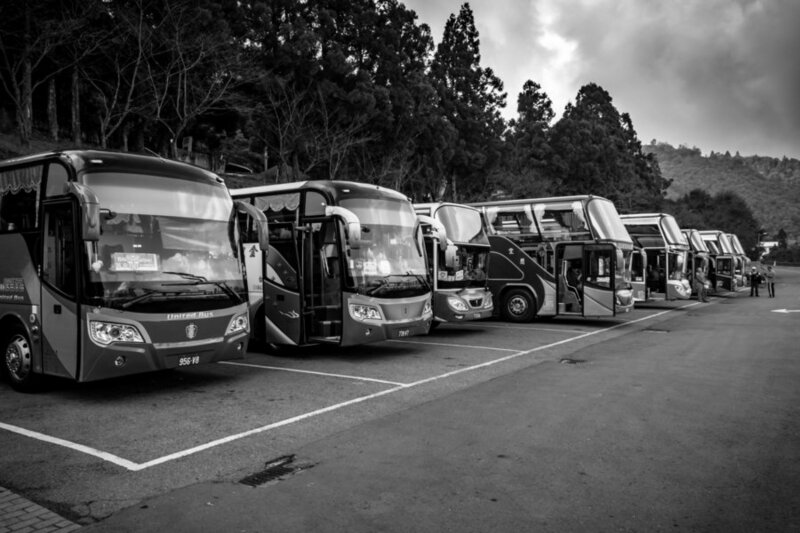 Tour buses in the parking lot of the rest stop at Qingjing. If you haven’t already read the first part in this series I suggest you do so. 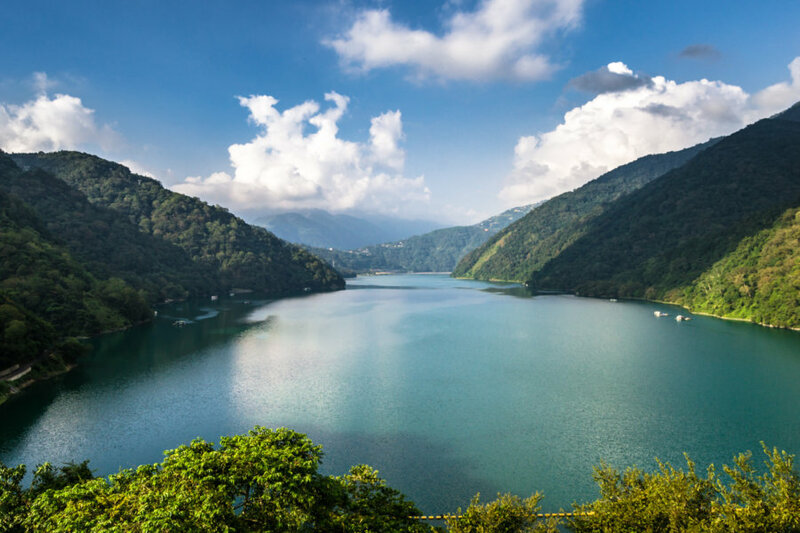 The next post in this series details some of what you’ll see in Puli itself and will conclude with posts about Sun Moon Lake and Xinyi Township. 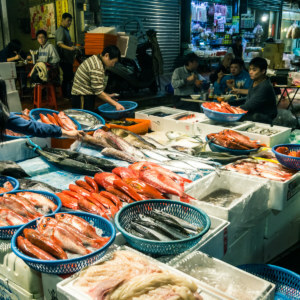 Hopefully you’ve found this informative—it ended up being much more work than I had expected given the paucity of English language writing about this remote region of Taiwan. Many thanks to Andrew Kerslake for reviewing this post! Fantastic work, mate, and beautiful snaps. So much great info here – even for a science dullard like me, the geological stuff was fascinating! Having seen reservoirs and lakes like that in other parts of the world, I’d always wondered. On another note, I hadn’t checked old Mike Fagan’s blog in yonks and had been thinking about it recently – has wondered if he was still around. Anyway, thanks for that. A real pleasure to read. Keep up the exemplary work!